Why is it important to use a Moisturizing Deep Conditioner (DC) you ask? 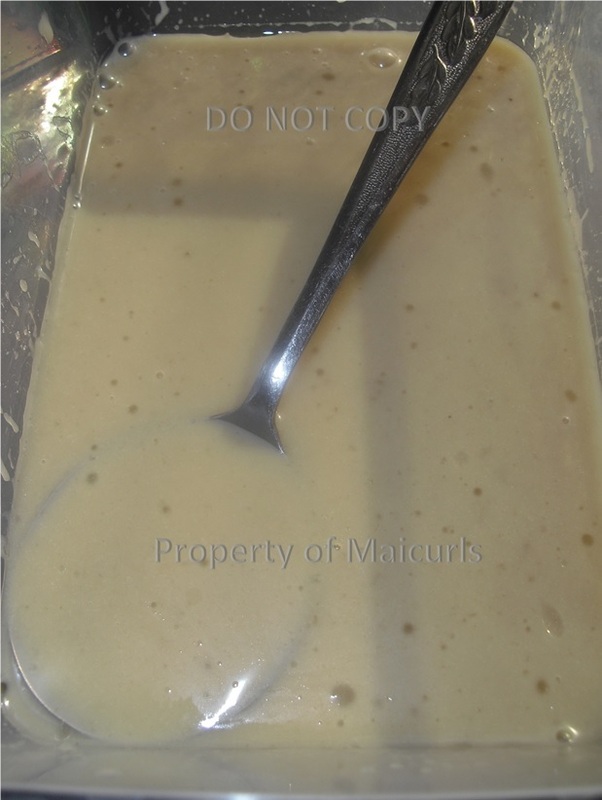 Well, first of all it is used to restore moisture balance in the hair which stops breakage. In order to determine when a Moisturizing DC should be applied can depend on ones hair, but if your hair feels dry, brittle and snaps when any tension is applied; then you might be in need of a moisturizing DC. While it is important to have/add moisture to your hair, too much moisture can result in mushy hair that stretches and stretches (over Moisturizing). 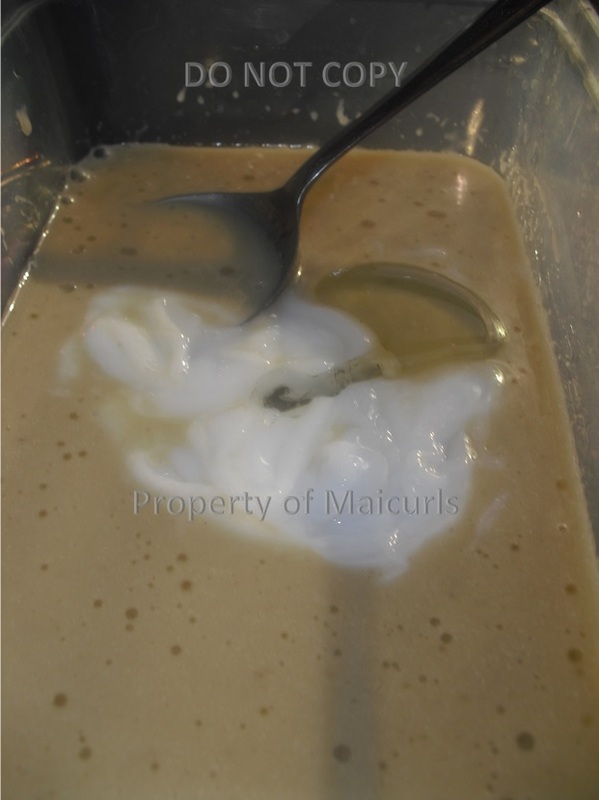 You might require a Protein Treatment to strengthen the hair if your hair feels mushy and stretches a lot (read more in my DIY Protein Deep Conditioner section). It is easier to “fix” an overload of Moisture versus Protein because restoring hair with a Protein overload can sometimes require several Moisturizing DC. If you overdo the Moisture it can sometimes only require one light Protein treatment to restore your hair back to normal (but this also depends on your hair. Everyone is different). My hair likes Moisturizing DC so I do them once a week. Now for my DC I do use a little ‘light protein’, namely coconut milk in the mix. I do not know what it is about the stuff but my hair LOVES it. All the other ingredients are very moisturizing so I think they basically “overpower” the coconut milk (can not think of a better word). Whatever the case the coconut milk does not make my hair feel hard even though I use it once a week and about 3 times a month. IMPORTANT! If you have allergies to any of the ingredients I use DO NOT use them! I am not a Doctor, Physician nor a Cosmetologist. I am just providing information for educational purposes and any use thereof is solely at your own risk. The information contained herein is not intended to be a substitute for professional medical advice, diagnosis or treatment in any manner. Always seek the advice of your physician or other qualified health provider with any questions you may have regarding any medical condition. Once you have done that, do patch tests before you put anything all over your head. Please consider this as my advice. You are responsible if you choose to follow some of my methods. 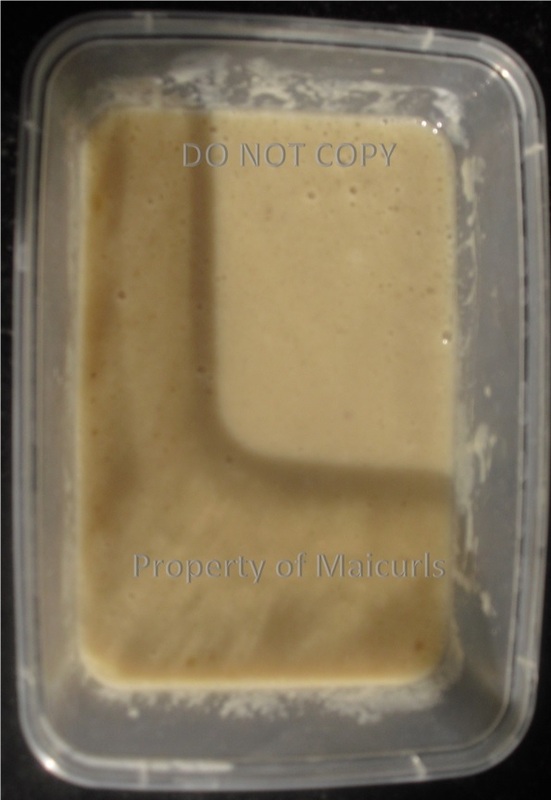 * I like using overripe bananas because they are softer and less likely to results in lumpy and difficult to rinse DC. You can substitute bananas with banana baby food. 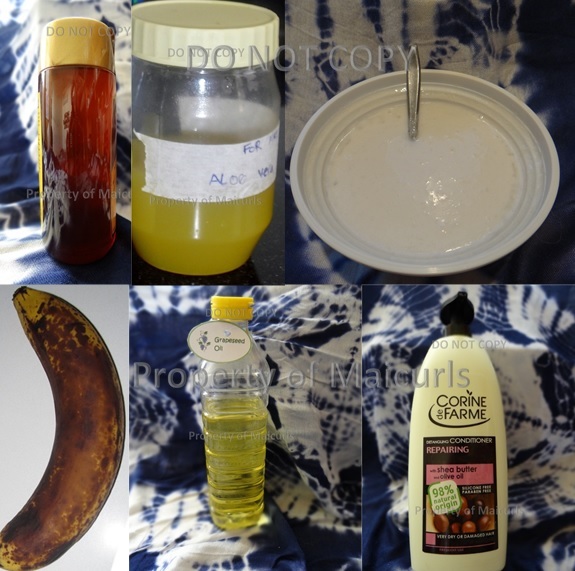 I blend the first three ingredients together (coconut milk, honey and the overripe banana).t is not necessary to blend however I like making sure I do not have bits of banana in my hair because it is extremely annoying trying to wash out banana bits from my curls. I then add the Conditioner, AVJ & Oil and mix everything really well. I always apply all of my DC’s to hair that has been Cleansed and Detangled. My hair is usually in 10 – 12 twists (I do this during my detangling stage refer to my Wash Day Routine) and apply the DC from roots to ends, paying particular attention to my ends. I cover my head with a shower cap or Clingfilm tie a plastic bag over it and then add a scarf. The scarf not only helps to ensure my scalp stays warm since I do not use heat but also can help to catch anything from trickling down my neck/face. I leave the DC on for 2 hour and then rinse it out. What is your favorite moisturizing DC? Do you mix your own or purchase it? I would love to know!